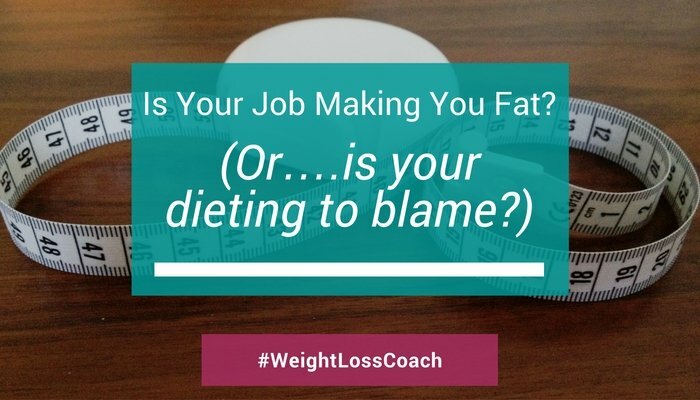 Are you blaming your job for your weight gain? It makes sense, our work takes us away from the gym, the goodies in the break room are tempting, and we are eating what others choose for us at conferences and luncheons. Then there is the additional issue of traveling for work that can make it challenging. Although all of these lifestyle factors can be a factor in how we take care of ourselves, is that really the reason for the weight gain? I think it is something else, and it’s sneaky. I think that the dieting is to blame, not the job. Diets can be wonderful, teaching us what foods are good for us, giving us a better perspective on healthy options. But most times, the diet ends up being the vehicle that we all use to judge ourselves and to judge ourselves harshly. You’re hardworking, smart and great at what you do (trust me here, you are!!) and when you notice that you’ve put on a few pounds you go on a diet. You start your Monday with a healthy breakfast, you scoot off to work, making plans to eat well all day. You make a great choice at lunch, you avoid the treats in the break room and you’re having a great diet day. You ate ALL good food and you even hit the gym on the way home from work. Voila, Day 1 DONE!! This goes on for a few days but by Day 4, you’re getting a little tired. You’ve said no to lunches out at your favorite tavern (because they have BAD food), you have gone home hungry (stayed on plan!!!) and controlled yourself at dinner (ate your food vs. the yummy dinner your spouse made) and you’re beginning to despise the treadmill that you force yourself to hit after work. As you wake up on Day 5, you’ve kind of had it, you feel like you’re missing out on the things in life you really love. You have a battle in your mind but before you know it, you’re having a juicy hamburger and fries at lunch, have enjoyed the birthday cake with the office gang and can’t wait to get home with the family to eat pizza tonight (no cooking!!). And watch out because on Day 6, you realize you have miserably failed at a diet once again. You feel like crap (your stomach did not like all that pepperoni pizza) AND you are having the biggest beat up speech you have heard (from yourself) in a pretty long time. Oh, and now it’s time to give your presentation to your boss and his partner on something that you’re really excited about. But……today……you aren’t so excited. Nope, you feel like crap. There is another way to lose weight………..it works and it doesn’t interfere with work. In fact, by becoming a more intuitive eater, by eating to your personal appetite, by learning what activity feels amazing in your body, you can also show up in a more powerful way at work. Trust me. I see it happen over and over with the amazing clients that come my way. Stop the madness……..blaming the job, leaving the job, hating the job is not the solution. But neither is blaming yourself, seriously. We’ve been sold a lie that all of the solutions to weight loss are outside ourselves, so many of us are stuck in this loop. AND it is eradicating our confidence and self esteem. There are some simple steps to get out of diet struggle hell…. Drop the judgment around all of your food choices and exercise. It’s just food and moving in any way you love is wonderful for your body. Eat ONLY when you are hungry (light growl) and stop when you are lightly full. Slow down when you’re choosing foods and ask: what would really taste good? You’ll be surprised but sometimes the answer might be kale or spinach!! Slow down when you eat, our bodies process our food better and turn it to fuel vs. fat when we eat more slowly. Here’s a 12 minute talk where I explain this a little more fully. My mini sessions are not sales calls. They are 20-30 minute coaching conversations where we can either drill down on one tool to learn or solve one particular issue you are having with weight loss. It’s my gift and serves me as a coach to learn more about what people struggle with in their weight loss journey. I’ve been broadcasting LIVE, come check out the videos on Facebook! Thanks for sharing this blog post on weight loss. Excellent read, I must say. The video completes this article. It couldn’t have got better than this, I think. Keep writing and sharing informative blogs like this. Thanks once again.